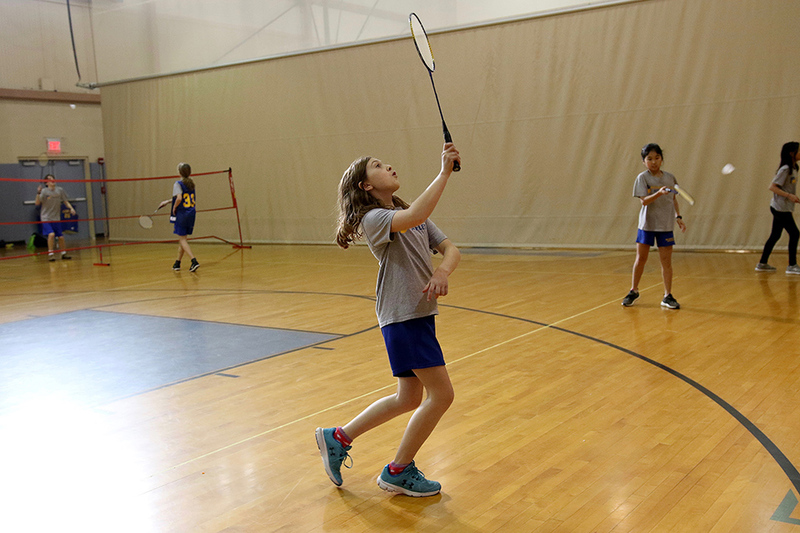 After spearheading an interscholastic middle school badminton league six years ago, Belmont Day found itself as the only school left standing this winter. Despite the lack of opponents, the program is as strong as ever and welcomed a record 18 athletes to the team this year. Thanks in large part to its core group of eighth graders, including team captains Colton Largay and Sophie Myers, the team’s spirit never wavered and athletes embraced the unique intramural structure employed by head coach Abbey Nyland. The team is divided into three squads that compete against each other to earn points (think Harry Potter houses here). Through healthy competition, every athlete has improved his or her skills. Coach Nyland has been particularly impressed with newcomers Charlotte McIntosh (positive attitude and improved serving), Audrey Wu (great teammate and focused approach), Lucy Myers (quick reflexes and well-placed shots), and Ben Rowe (passion for the game and dedicated approach). After beating Fenn by nine on Wednesday, the boys’ varsity basketball team lost its first game of the season (34-33) to a feisty DCD team on Thursday. Jacob Gregor carried the load in both games. The girls’ varsity basketball team also split a pair of games this week, beating Nashoba (22-16) and losing to DCD (30-20). Elizabeth Amaratunga was strong offensively, while Margot Klug controlled the D.
Thierrence Mathurin and Zephy Borisy excelled defensively during the boys’ JV basketball team’s hard-fought loss at home against Fenn this week. The girls’ JV basketball team won its third straight game (22-18 over Nashoba) this week, improving to 3-3 on the season. Lynn Lewis led the team with eight points. The fencing team toppled BB&N 20-7 this week, improving to 5-1 on the season. Anni Taylor had an impressive win, while Scott Abbott and Devon Holman each won twice. Wrestling won 6 of 14 matches against Fenn this week. Julian Tinmouth’s nearfall points with a half nelson earned him a win, while Xander Lightbody’s takedown and pin was the most impressive win of the day. Sarah McPeek and Lauren Kopperl had strong defensive games for the volleyball team this week. Aaniya Riddick was fierce at the net, recording her second consecutive strong game.